A HUGE "Thank You" to all of you for reading the blog throughout the year! We had another fun year celebrating 45 author and illustrator birthdays! 1. Dr. Seuss Reading Experience -- This post featured a FREE printable activity packet to celebrate Dr. Seuss's birthday. The downloadable packet includes 12 activity ideas and for books by Dr. Seuss. All the activities have been tested by our family! 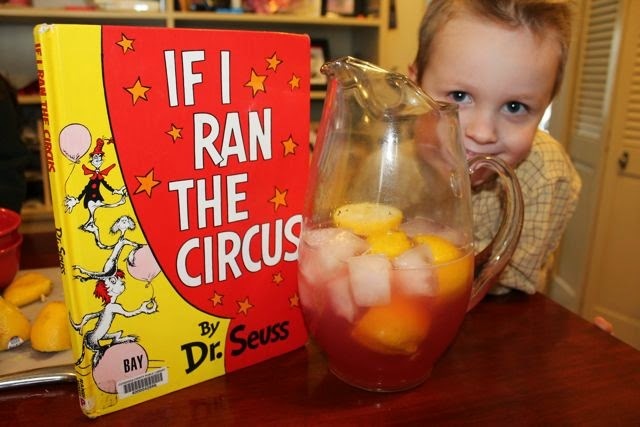 Some of the activities include Mr. Sneelock's Lemonade for If I Ran the Circus, Did You Find them All Sir? Beetle Battle in a Bottle Game for Fox in Socks, and free printables for Thidwick the Big-Hearted Moose and The Zax. This packet was downloaded over 3,000 times on Teachers Pay Teachers too! 2. Happy Birthday, Grace Lin (May 17) -- This post included a recipe for fortune cookies. 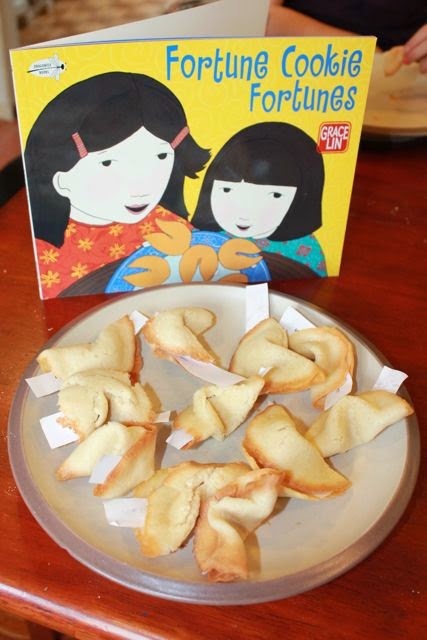 We made them after we read Fortune Cookie Fortunes. The cookies were fun to make and they were delicious! In this post there was a bonus birthday celebration activity! We made homemade kites after reading Kite Flying. They flew...not very well, but they did fly! 3. Happy Birthday, Eugene Yelchin (October 18) -- Who ate all the cookie dough? WE DID! 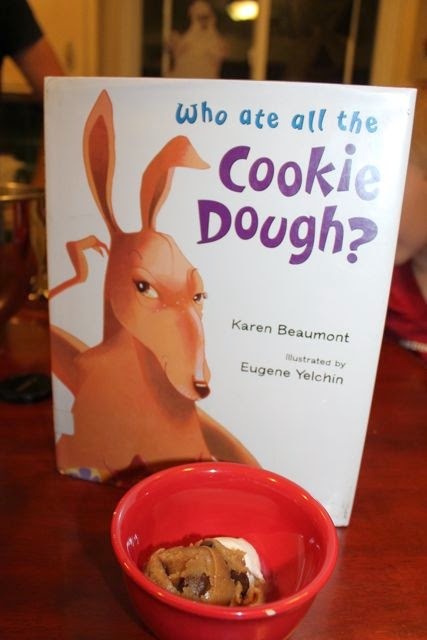 My children loved the book Who Ate All the Cookie Dough? and they really enjoyed the cookie dough treat topped with ice cream. 4. Happy Birthday, Blair Lent (January 22) -- I am starting see a theme -- bring to life a children's book with cookies and people will read the blog post. 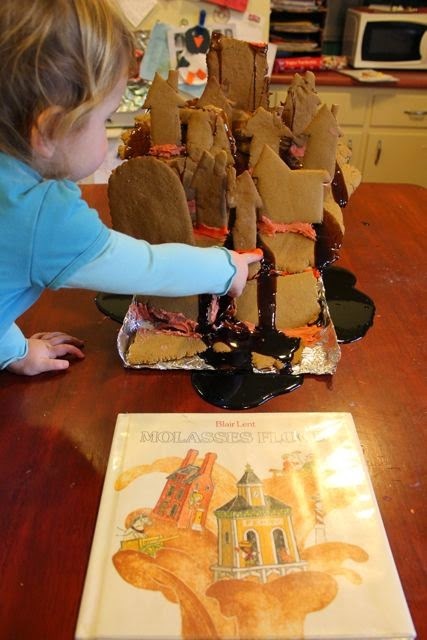 To celebrate Blair Lent's birthday we read Molasses Flood, built a town out of gingerbread cookies, and flooded it with molasses! This was so much fun. The best part was we left the mess out on the table for my wife to find when she got home from work. I wanted her to see how much fun we had. 5. Happy Birthday, Deb Lund (February 7) -- To celebrate Deb Lund's birthday we loved all her books and our favorite was Monsters on Machines. We played Pin the Monster on the Machine and explored blueprint drawings. The grand finale for the celebration was using the blue print drawings to construct a CUSTOM PREHAUNTED HOUSE. Deb Lund shared birthday stories and memories too! 6. Happy Birthday, Lisa Wheeler (January 3) - This was our first celebration for 2013 and it was a fun one! We drew with ashes and cinders we found in our fireplace. This was inspired by the poem The Dirty Kid in Spinster Goose: Twisted Rhymes for Naughty Children. 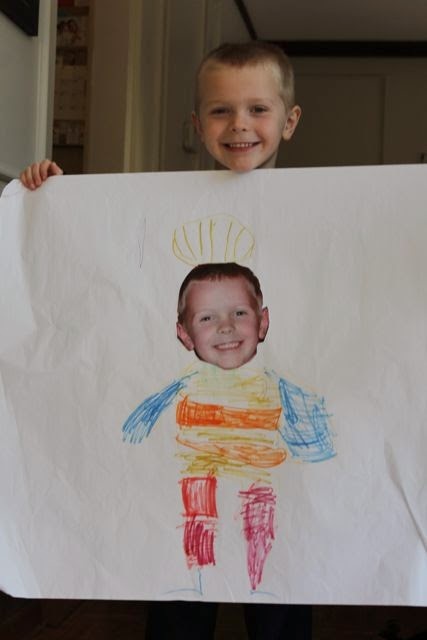 My youngest son still talks about the day we did this art project. 7. Happy Birthday, John Bemelmans Marciano (February 19) -- We celebrated John Bemelmans Marciano's birthday with a visit to a local comic book shop and then came home to copy artwork from the comics at our kitchen table. We were inspired to do this after I heard Marciano speak at the Mazza Museum. He mentioned that he loved doing this as a child. 8. Happy Birthday, Dr. Seuss (March 2) -- This year I was lucky enough to celebrate Dr. Seuss's birthday at local schools and businesses. This post shares the activities that I made for the events. 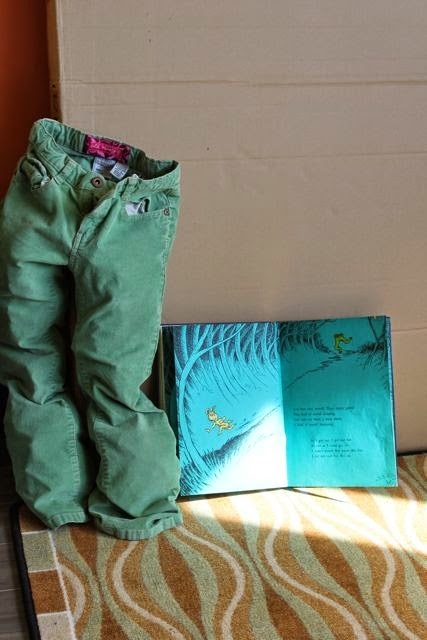 It also talks about the Pale Green Pants with Nobody Inside Them that I made to bring to life What Was I Scared Of?. 9. Happy Birthday, Anne Rockwell (February 8) -- This post includes the Anne Rockwell Reading Experience which is a FREE downloadable activity packet that includes 12 activity ideas to bring to life Rockwell's books. 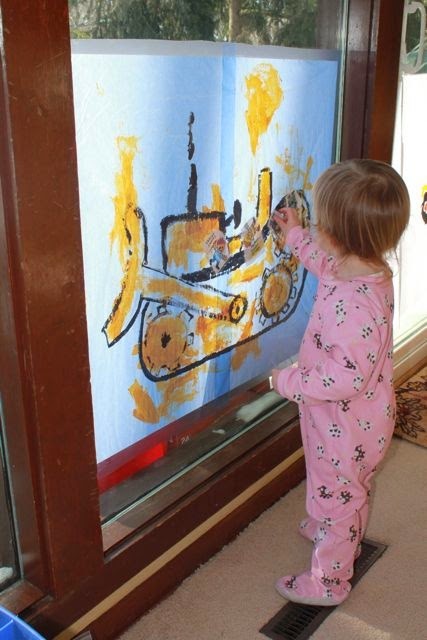 All the activities are perfect for preschoolers! 10. Happy Birthday, Mark Teague (February 10) -- We listened to Mark Teague speak at the National Book Festival where we learned that he colored on a brand new pair of white sneakers when he was a kid. 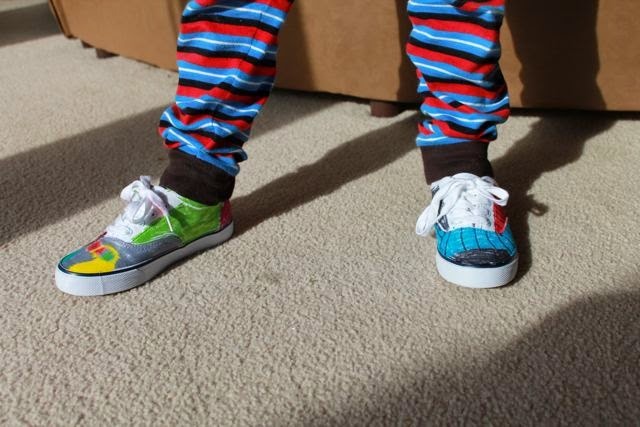 I bought my kids brand new white canvas shoes and let them decorate them with Sharpie markers. 1. 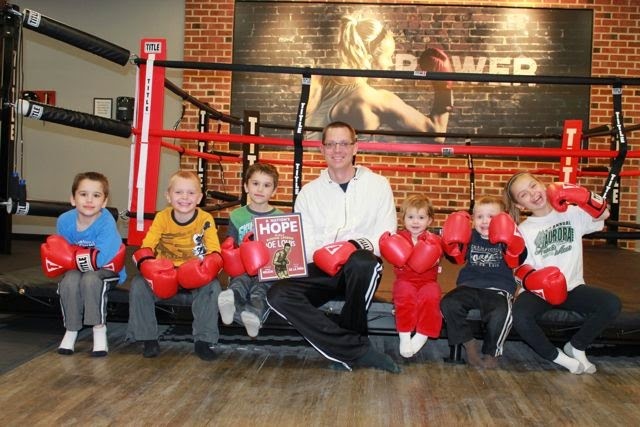 Happy Birthday, Matt de la Peña (February 9) - We read A Nation's Hope: A Story of Boxing Legend Joe Louis in a boxing ring at Title Boxing Club! All my children and a few of their friends tried on boxing gloves and hit the heavy bags too! 2. 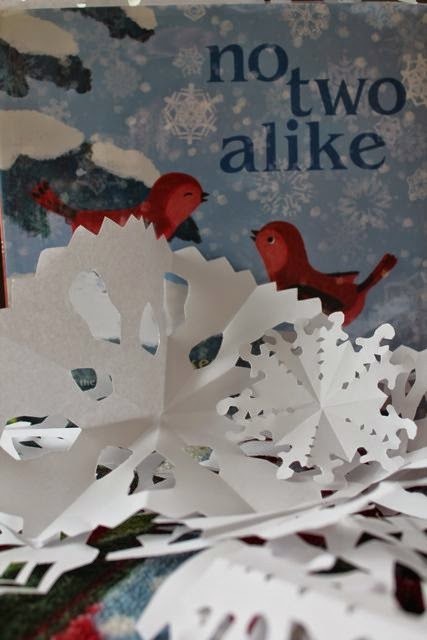 Happy Birthday, Keith Baker (March 17) -- We heard Keith Baker speak at a local library and he taught everyone in the audience how to make six-sided paper snowflakes. He asked us to share how to make them with someone we knew, so we shared the instructions with you! 3. 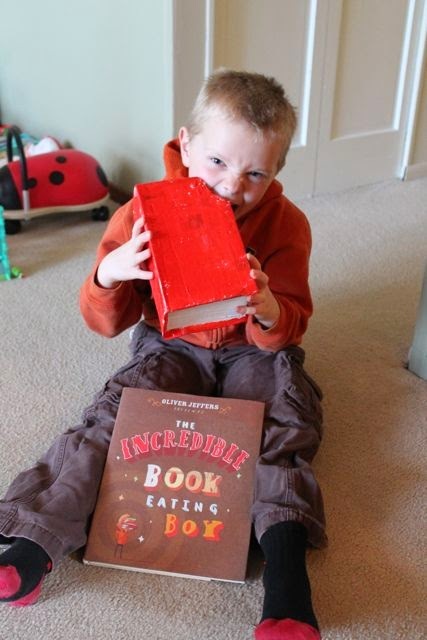 Happy Birthday, Oliver Jeffers (May 10) - My son's favorite book is The Incredible Book Eating Boy. For Right-to-Read Week at his school he dressed up as Henry from the book. We made a papier-mache half-eaten-book for his costume. 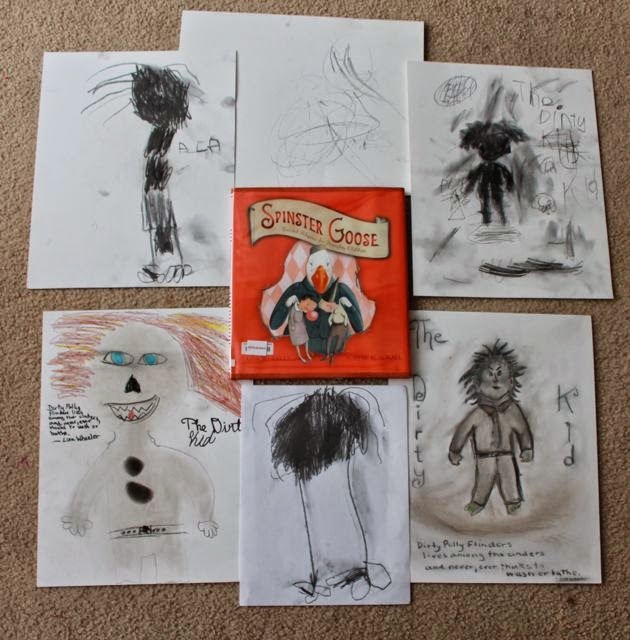 The post also includes an activity to bring to life The Great Paper Caper! 4. 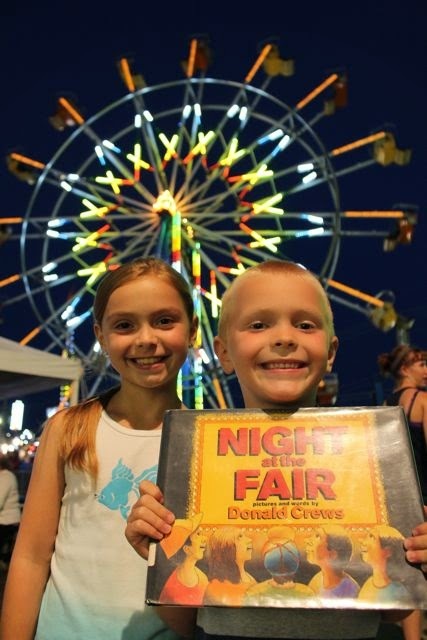 Happy Birthday, Donald Crews (August 30) -- We read Night at the Fair and went to the local fair on school night. We stayed up way past our bedtime but it was so much fun! 5. Happy Birthday, Paul Fleischman (September 5) -- We visited The Ladew Topiary Gardens on the way to Washington D.C. for the National Book Festival. 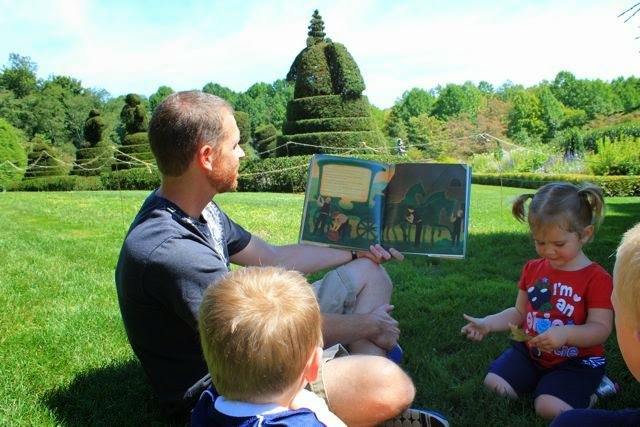 We read The Animal Hedge surrounded by beautiful topiary. This is probably one of the top 10 most memorable reading experiences of all! I wish you and your family a wonderful holiday season and a Happy New Year! Thank you for being a reader of Happy Birthday Author. 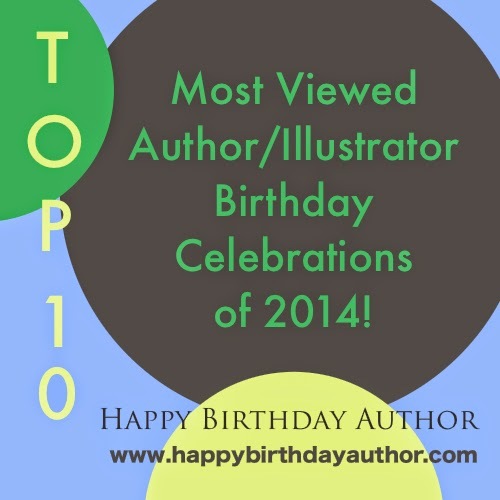 I am looking forward to bringing you more author and illustrator birthday celebrations in 2015! 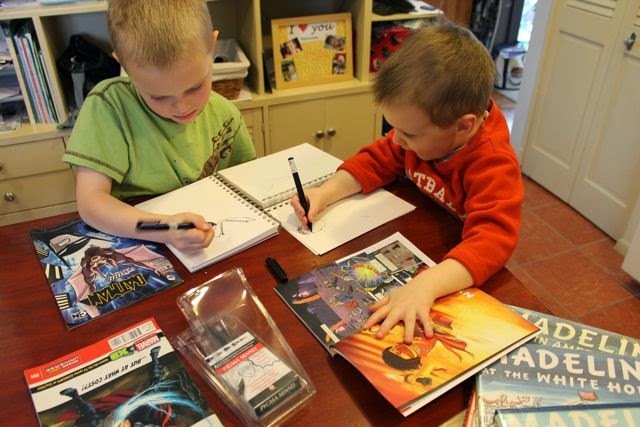 Is your New Year's Resolution to celebrate author and illustrator birthdays with your family? Check out my "How To Guide" for suggestions on how to get started! Also, enjoy the Author and Illustrator Calendar View to plan out your celebrations for the upcoming year!